If you've ever wanted to know how to make hanging flowers baskets, read on. We have details on how to make beautiful baskets without breaking your budget in the process. 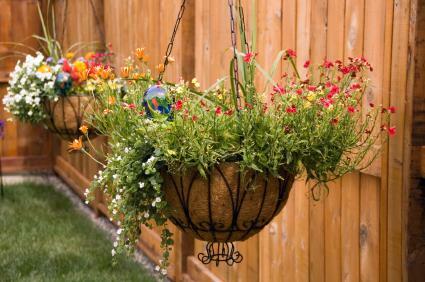 The following instructions will help you make a beautiful hanging basket that has flowers evenly distributed throughout. Preparing the basket is an easy process. Wash the basket, especially if it was used for plants in the previous year. Use soapy water and a brush or sponge to clean and then allow it to dry. To prepare the soil for the basket, combine the soil, slow release fertilizer and water retention beads together. Take the moss and dunk it in a bucket of water; allow it to sit and soak up the water for at least an hour. Set up your basket so you can view it from all sides easily. If you have a basket with a rounded bottom, place it in a slightly larger bowl or pot so it won't tip while you work on it. Before you begin to make the hanging basket, arrange the flowers on a table in a design you think you would like. Vine-like plants should be on the bottom or top rim of the planter. The taller plants should be placed on the top and flowering plants will fill out the sides. Remember to balance out the plant colors so a single color doesn't dominate one side of the basket. Now that you're ready to begin planting your flowers and vines, the moss will need to be wrung out like a washcloth. Shake off the excess water and place on the bottom of the inside of the basket. Keep adding clumps of moss and working your way up the sides to the top of the basket until you have completed the bottom third of the basket. Carefully add your plants to the bottom third of the basket, the plants will be laying on their sides, facing to the outside of the basket. Alternate the different kinds of plants to create interest. Add soil to the bottom third of the basket to completely cover the plugs of the new plants. Add another inch or two of moss around the sides of the basket and add a second layer of flower or vine plugs. Add more soil and continue adding plants, moss and soil until you are within an inch from the rim of the basket. Once you are close to the rim of the basket, it is time to plant your trailing vines and tall plants in the center of the top of the basket. Plant the outer plants first, then fill in the center and fill in with soil. Add moss to complete the rim of the basket. Check your completed project to make sure the plants are secure. If some clumps of moss fall, simply replace them. As the plants grow during the season, they will attach to the moss and they won't fall out anymore. Thoroughly water your basket before you hang it up. The water retention beads will keep your plants hydrated and reduce the number of times you will need to water your plants. If you don't use the water retention beads you may need to water your plants twice a day during the summer. For those that use the water retention beads, watering the plants every two to three days will be sufficient. Now that you know the basics of how to make hanging flowers baskets, use your creativity to design even more beautiful baskets for your home.